Home / Local Events / Mixed Bag / BOLLYWOOD CRUISE PARTY - DJ PRASHANT ! BOLLYWOOD CRUISE PARTY - DJ PRASHANT ! Summer is here we love staying outdoors so lets party this weekend on a Yacth ..Yeah you hear me right ! 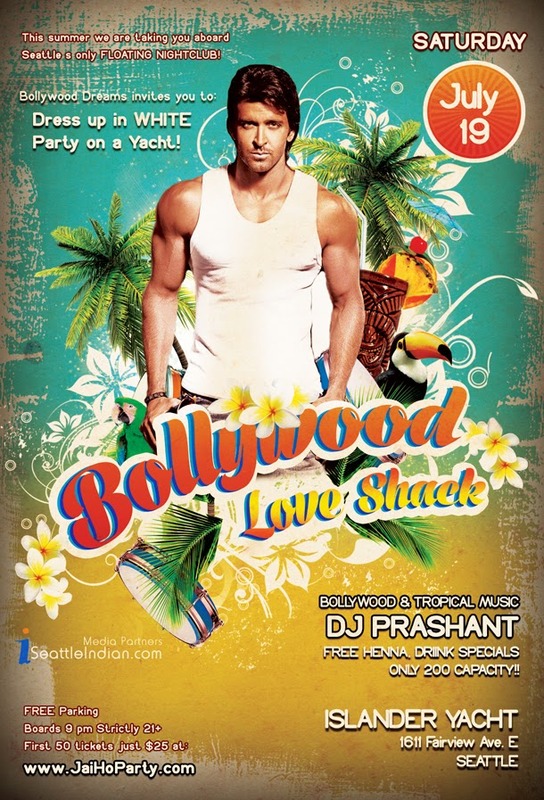 Dj Prashant who is well known for his Jai Ho Bollywood parties invites Seattle this time to party on a yacth. DJ Prashant is appreciated for his club culture where East meets West ! Every single time I wait eagerly to attend his concerts ! Infact he is the only one who really knows how to keep his crowd entertained with non-stop music and fun. He has his own unique style and we love it ! He does teach dance steps to popular bollywood numbers at every party and I love this section of the concert where all are dancing together and in sync! I the last one I attended was an Jai ho - HOLI party which was AmazzZING ! Please note this event gets sold out pretty soon, I purchased my tickets, HAVE YOU ?? To purchase online CLICK HERE ! Date: Saturday, JUL 19 2014. Remember to dress up in WHITE ! Around 9:30pm The BollyWood cruise takes off from the above address. So while we sail- we dance ! Special HighLights of the night, just in case you haven't attended one before ..
• Dance all night to the best of Bollywood & Tropical music with DJ PRASHANT!